Do you not love the sunrise? Or cloudy skies, no matter. Letting in the new light. To be the person each of us wants to be. And sing your song to the dawn. To be sure, I love the sunrise. Lately, I have not seen it, but it awakens me despite my deep slumber. I saw this Rumi quote this morning, and it described how I felt upon waking to the sunlight filtering through my curtains. This is my attempt to share that emotion with you. I have not been able to keep up with people’s blogs lately, I hope once the house is on the market I have a little more time. I get the notices on my phone app, in my email, and I save them all to read, and pretty soon I have like 20 to read. So, I’m apologizing for ignoring them. I guess its one reason I want to retire, so I have the time to keep up with everyone. The realtor is coming tonight. We’ll probably sign a contract, settle on an asking price for my house. She sold me the house, so knows it well, and she lives across the street from me. It should be an easy meeting. Yes, pretty sure that was the problem. Yes, well, Rumi. It certainly is. When we are wounded so deeply, we have to search deep in order to rediscover our value. Rejection, wounding, shake our foundations, don’t they? We have to look deep, and somehow let that light in so we know, once again, we have value just because we exist. We cannot find our value externally. tt exists within us, always. Through this lifetime from the moment we are born, and into the next one, if you adhere to that school of thought. The question is, how do we want to live this life, this one precious life? Searching for the validation that already exists within, that we are connected to the one great thing, looking for someone else to tell us we belong? Or…do we want to take the beautiful soul that is each of ours and find another soul who can join us in a journey to go deeper, higher, more joyfully? The light enters the wound, because we all make the wrong choice at some point. Or at least most of us. I think this life is meant to evolve our souls, and there is no growth without pain. We were meant to make the mistakes, we were meant to live through them, we were meant to learn from them. Then, the light enters the wounds, illuminates the lessons, and makes us glow. I think there are people that cross our paths that can see us glow. I also think there are people who cross our paths that cannot see it. Just because someone can’t see it, doesn’t mean it doesn’t exist. It means that their state of consciousness doesn’t let them yet see it. I think when the light enters our wounds, we are bound to spread that light to others whose darkness doesn’t let them yet shine. I feel like the light has entered my wounds, it is fast at work making parts of me glow that I thought had died. I find that I have some attachment to the wounds, that they remind me how I loved, and loved loving. But the light says, you can love again, and it won’t leave these wounds. I saw a crack in the one who wounded me the other day, I saw the armor not completely sealing him. I hope he lets the light in, I hope he finds a life that can bring him joy for the rest of his years on this earth. I hope he doesn’t waste this one precious life, settling for what is easy. I hope he finds a life worth working passionately for. I hope the light can enter his old, and deep wounds and let his self worth begin to glow. It would make me happy to see that transformation. It would also bring meaning and purpose beyond the lessons I already have learned, if those things rippled out to him and others. I got the nicest comment on a blog this morning, where someone thanked me for being a blog that constantly inspired them. This is really one of the main purposes of blogging for me, to share the lessons and let the light shine that was given to me. It was wonderful to wake up to read that, and know that my words helped someone else. I hope the light that wrote those words that helped that person shines on everyone, even him. Maybe, especially him. Hurt people hurt people. I have done it, hurt others, even him, when I have been hurt. But now, I want to shine the light, whatever light I have, be it just one candle or a floodlight, on others. I don’t want to hurt anyone again, if I can help it. And I can. Let the light in. 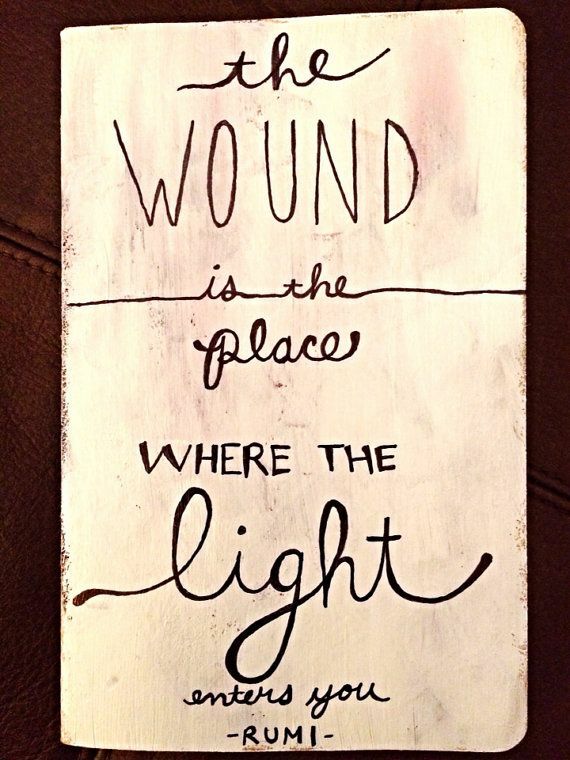 More wounds, maybe mean more light can get in. Maybe our souls and hearts can be mended like the Japanese custom, with gold, so that they have even more value than before they were wounded. Let your wounds glow, and let us all light the world.